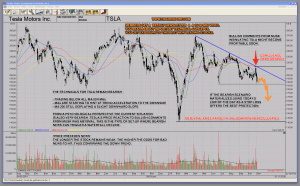 One of the most popular stocks out there is undoubtedly TSLA – Tesla Motors. Its charismatic leader Elon Musk is widely followed, sadly the technicals of the stock remain bearish. 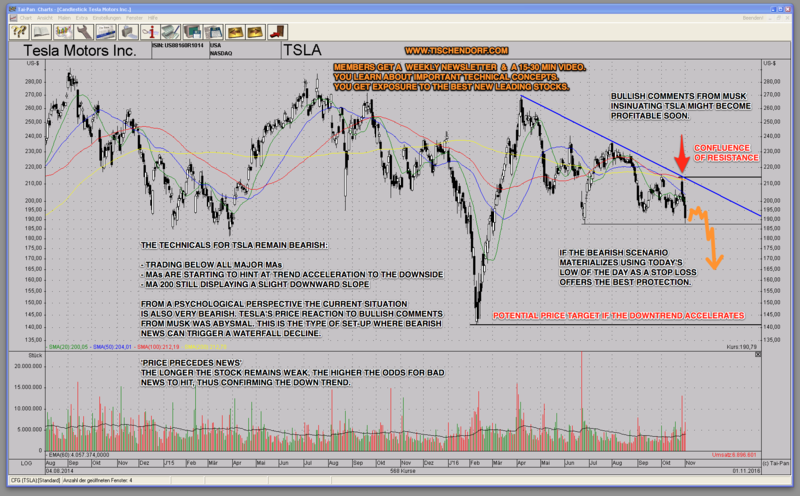 As you can see in the chart, Tesla hit an area of multiple resistance. Whenever price gaps into ‘Confluence of Resistance’ it usually gets rejected on the first attempt. What is worrisome here is the underlying trading psychology. Elon Musk indicated Tesla might be on the verge of becoming profitable. This is probably the most bullish piece of news you would expect from a CEO during a company’s conference call. A quick look at the chart reveals the whole story. Price reacted very badly to that piece of news and over the past few days the stock was hit with relentless selling pressure. We now have a stock that wasn’t able to react well to good news and keeps trending down. ‘Price Precedes News’ is the famous market adage that comes to mind here. In Tesla’s case it could mean bad things are to come. If price does accelerate to the downside, bad news would simply add fuel to the fire and confirm the current downtrend. There is good news though. You do not need to ride a stock during a waterfall decline. Using a stop loss can protect you from big and painful losses. With a Premium Membership you get a weekly newsletter where you learn ‘How to make money’ and more importantly, ‘How to protect your profits’. Every newsletter comes with a 15-30 min video. Grab a cup of coffee, lean back and find out about the best stocks and new market leaders!